After the first round of the third Republican primary debate, in which the 2016 GOP candidates who were polling at less than 3 percent were invited to discuss the issues, there was one senator on everyone's lips. That person was South Carolina Sen. Lindsey Graham, who delivered plenty of impassioned remarks during Wednesday evening's so-called "undercard debate." Many have made jokes about the first debate round being unimportant, when compared with the other GOP debate, which will include the candidates polling with at least a 5 percent rating. But it's important to remember that during the first Republican debate, former Hewlett-Packard CEO and presidential hopeful Carly Fiorina was on stage during the "undercard" segment, too — and she won viewers over so much that she graduated to the primetime stage for the following two events. Perhaps Lindsey Graham, who won the JV Republican debate by basically turning it into the Lindsey Graham show, will do the same for the next debate. Graham campaigned wholeheartedly for Republican voters' attention during the debate, delivering plenty of great one-liners and defending a variety of controversial viewpoints. Most notably, Sen. Graham said, "Make me commander in chief and this crap stops," arguing that the United States' "enemies," such as Vladimir Putin, don't respect the United States because they see President Obama as "weak." "Do you think Putin would be in the Ukraine today if Ronald Reagan were president?" Graham asked. "Why are the Chinese stealing our intellectual property, hacking into our system? Why are they building islands over resource-rich waters? Because they can get away with it." That surprising speech is just one of many audacious things Graham did during the debate that made him stand out from the pack. Lindsey Graham also criticized Donald Trump's campaign slogan, saying that "America is great" in its current state. He also took aim at the Democratic presidential hopefuls, saying that Vermont Sen. Bernie Sanders "went to the Soviet Union on his honeymoon, and I don't think he ever came back." As for former secretary of state Hillary Clinton, Graham said that she "thought she was flat broke after her and her husband were in the White House for eight years." 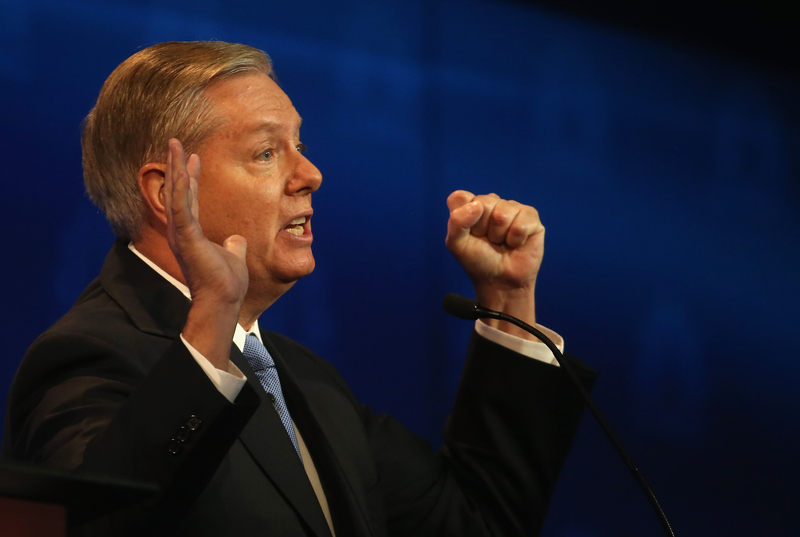 If Americans didn't know who Graham was before the third Republican debate, they certainly do now. And whatever your opinion of Graham and the Republican party, you have to respect him for offering such passionate criticisms of his opponents, even if they're polling more favorably than he is. Sen. Lindsey Graham was the clear winner of the "undercard" JV Republican debate, so you can expect to see his name pop up a lot more often in the coming weeks.